SUNNYVALE, Calif., Nov. 13, 2018 -- AEssenseGrows, an AgTech company specializing in automated precision aeroponic platforms for consistent high-yield plant production, today introduced a unique new line of grow lights optimized for premium value plants like cannabis. The AErix LBR003 grow light delivers the specifications required to improve the quality of buds grown indoors along with all of the automation features large cultivation facilities desire. AErix lights offer a balanced broad spectrum coupled with high photon efficacy, making them ideal for premium leafy plants. The lights will be showcased Wednesday through Friday at MJBizCon in Las Vegas at the AEssenseGrows booth, #2473. AErix lights (dimensions: 40”x50”) provide intense output with wide wavelength coverage and full light spectrum with an average PPFD of 1,000 µmol/s/m2 when placed 6 to 12 inches above the plant canopy—optimal for cannabis. With a maximum power usage of 700W, the lights are less than 3 inches thick including the power supply with no fan required. All AErix lights include an IP65 water repellant rating covering everything you want in a high humidity-intensive grow room. The AErix lights drew praise from Joel Cuello, professor of Agricultural and Biosystems Engineering at the University of Arizona and a global expert in indoor farming. The new networked lights include many automation features and are optimized for the AEssenseGrows AEtrium-4 Bloom System. Fully controlled by the Guardian Grow Manager central control system software, the AErix lights include 0-100% dimming through an integrated AES link for complete scheduling and intensity automation. When connected, the lights automatically daisy chain to the network and can be sequenced in massive grow rooms to soft-start, one row at a time, without complex relays or programming. Also included is a wide range 100-277V universal input power connection so the light is ideal for all power grids and geographies. The AErix lights will deliver as much as 16-24 pounds of dry trimmed bud per light per year, at below $150 per pound at scale. The complete AEssenseGrows system will be on display this week at MJBizCon Las Vegas. The lights are automated to enable scheduling at various intensity levels. They are built for longevity and requirelittle to no maintenance. The AErix light is verified by the Electrical Testing Laboratories (ETL) safety certification, exceeding or surpassing all Standards for Safety published by UL and other standards bodies. 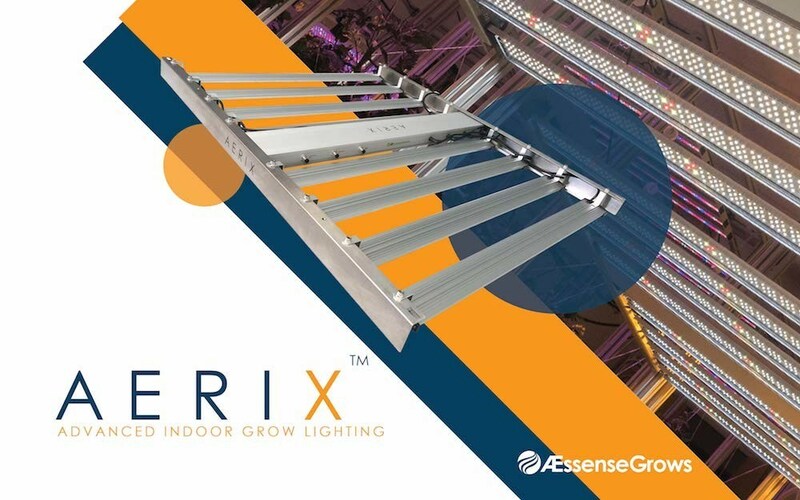 For more information about the AErix lights, including a data sheet and user manual, visit the AEssenseGrows website or contact Gibson at pgibson@aessensegrows.com or 669.261.3086. Ackrell Capital listed AEssenseGrows as one of the firm's Top 100 Private Cannabis Companies for 2018. AEssenseGrows (pronounced "essence grows"), founded in 2014, is a precision AgTech company based in Sunnyvale, CA. AEssenseGrows provides accelerated plant growth SmartFarm platforms and software automation delivering pure, zero pesticide, year-round, enriched growth to fresh produce and medicinal plant producers globally. With AEssenseGrows, you can precisely control your production operations at your fingertips from anywhere in the world.